About an hour-long train ride from Tokyo you’ll find yourself in Kawagoe, where Masanori Oji runs his design firm Oji & Design. The studio was founded in 2004 after many years working as both a graphic designer and an architect, the latter a subject he was educated in and graduated from in 1997. 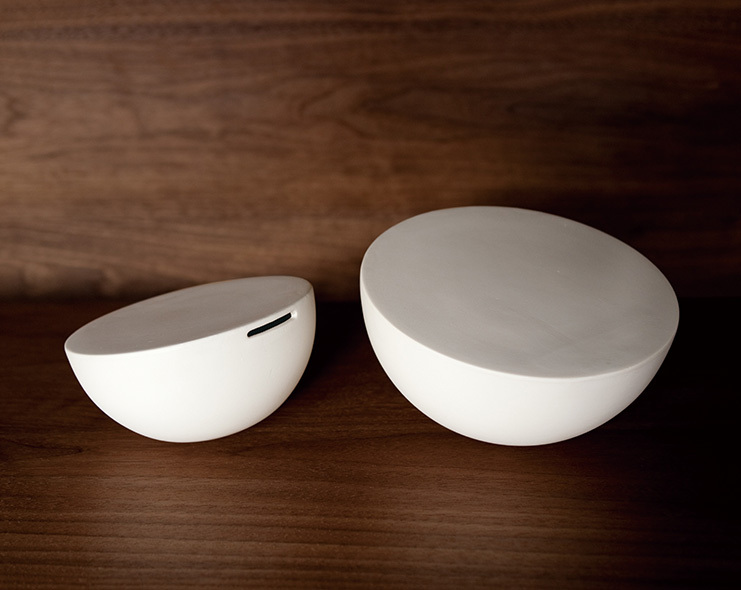 Oji primarily designs household goods meant for practical everyday use. 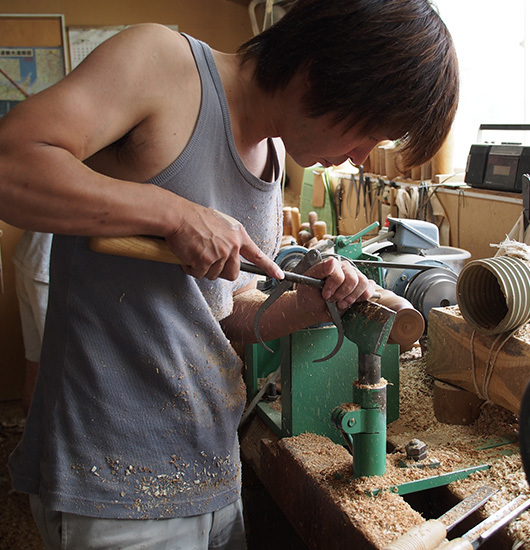 Oji Masanori is genuinely one of my favourite designers, an individual that works and collaborates with a variety of craftsmen and makers across Japan. Many of these independents have a rich history when it comes to producing, Masanori is there to enhance and promote this through his design, paying careful attention to form and proportion, but also the material and the manufacturing methods that they use. His work is meant to be used in everyday scenarios, mainly around the home, in addition to the product design he also designs the packaging for his much prized objects. His appreciation for craft in design has led him on this outward journey, so when I had the chance to bring him to the forefront of the website and exchange words with him I snapped up the chance. It’s certainly intriguing to hear his thoughts on design and what he tries to achieve through his work. Read our exchange below. 1. Describe your path to becoming a designer? I studied calligraphy in high school and architecture in university. I had an unshapen, vague idea about my career right after graduation. I didn’t know what I was really fit for or wanted to do. I first worked for an architectural design office. During this period, I felt that large-scale objects didn’t feel real to me. So I changed my job and worked for a graphic design office. I again felt that the flat-surface world didn’t suit me, and I spent some time wavering. It was when I established my own office, made my own products and sold them that I finally thought, “This is it!” It just clicked. I realised then that I was better at objects rather than space, and that I liked textural things better than flat surfaces. I also realised that different scales suit different people. 2. Were you surrounded by art and design when you were younger? Was it something you picked up from your family, or did it just mature naturally? I had no artist or designer around me when I was a child. I don’t think there was any art work or famous product in my family’s house. My father was a businessman working for a big company, not an artist. My mother was a full-time housewife. A portrait of Japanese designer Oji Masanori, captured at his studio in Japan. 3. Was there a particular moment where you knew what you wanted to do? As I wrote for the first question, my idea was very vague at the beginning. I established a design office at my birthplace Hiroshima, where I specialised in graphic design. During this period, I designed and sold some self-products. This experience made me want to do more product designing, so I left the Hiroshima office to my business partner and moved to Tokyo. There I started a new business around product designing. 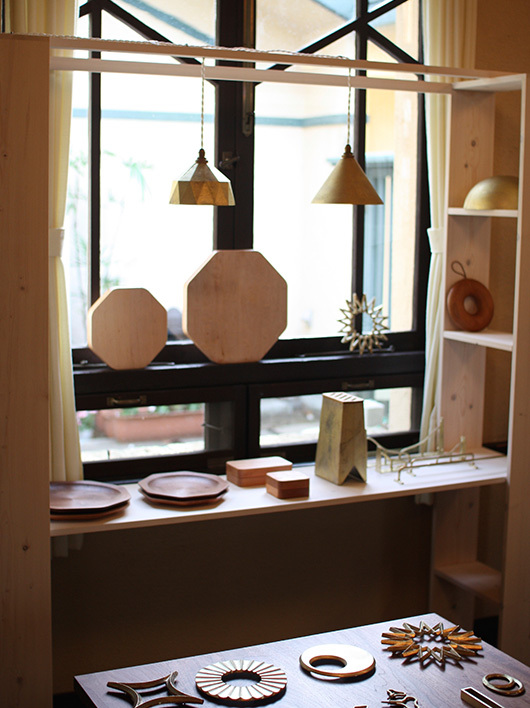 I met design director Shu Hagiwara and craft buyer Akiko Hino along the way. They introduced me to the work of designing crafts and traditional handicrafts. 4. Did you have any mentors along the way? I wouldn’t be doing what I am now had I not met calligrapher Toshihiro Kobayashi, who taught me calligraphy in high school. Generally in Japanese education calligraphy lessons aim to improve the pupils’ handwriting. Mr Kobayashi taught me calligraphy as “art”, and I apply what I learnt then to my current job. 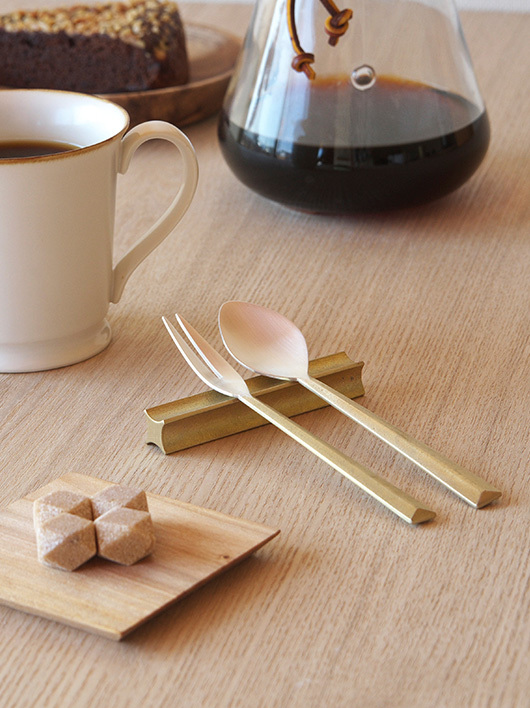 Brass FUTAGAMI objects designed by Masanori Oji, pendant lamps, cutlery and bottle openers. 5. Interestingly, you cover every part of the design process, such as packaging and graphic work. Do you feel this gives you an edge over other designers who only specialise in one area? Every time I start a new project, I first decide the project name and design a logo. The name will carry the spirit of language, and the logo will serve as a flag for the project. I also learn about the material and tradition. I get to know the company president and craftsmen working in the factory. Then I think what I can do. I do as much as I can by myself because most manufacturers I work with are small and don’t have ample funds. I believe that it enables unaffected, solid branding when I get involved in every aspect of the project. Different designers have different approaches. Although mine may differ from those who only specialise in designing, I don’t think it particularly makes me superior or inferior. What matters is that we each do our best in our own circumstances. 6. Why are you drawn to working with different craftsmen or companies that have some sort of tradition? I find it attractive because it’s different from mass production. It is extremely important that you know who has made the products and what material is used. Also, I personally like and respect traditional arts and crafts which represent continuousness of the past and future. Inside the FUTAGAMI factory in Toyama Prefecture, Japan. 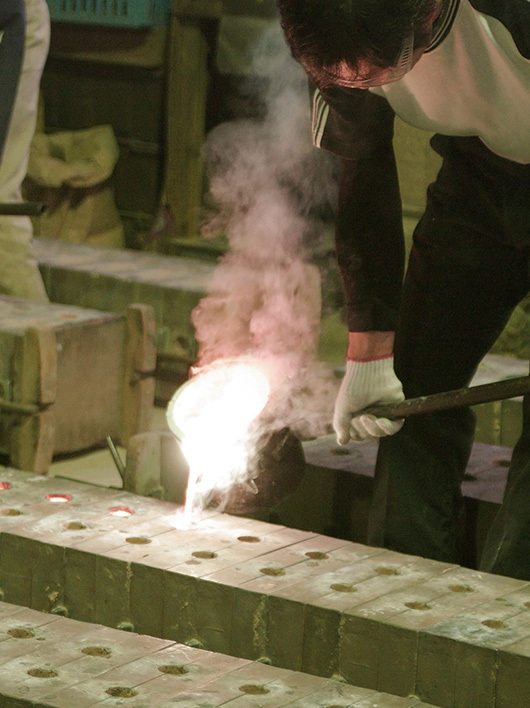 You can see the craftsmen pouring the brass in to separate moulds. 7. It must be quite a collaborative process with the people making, also eye opening for you as a designer to see the limitations in the production process? I always observe the manufacturing method and the material closely. I often speak to the company president who also works as a craftsman. Even though I can’t understand everything, I respect what I see and hear. 8. The FUTAGAMI products that you’ve designed are possibly some of your more popular items. What were the challenges when designing these? FUTAGAMI originally made Buddhist altar fittings. I have been working with them for the last five years to create products with the unique brass texture. 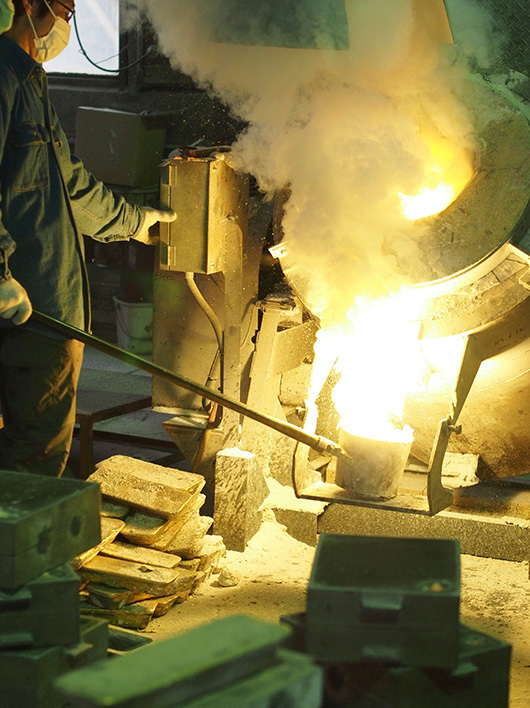 The casting surface of the brass products has a rough texture. The FUTAGAMI products come in many different forms, but they all share this characteristic of rough brass texture. I found it particularly challenging to adjust the weights of the bottle openers and the cutlery. When people hold those products in their hands, they sense if they are “too light” or “too heavy” by only a few grams’ difference. I thought that the bottle openers felt comfortable in hand when they were a little heavy, so they eventually increased in thickness. The manufacturing process of the cutlery is extremely sensitive and intricate. It took a long time for me to finalise the finish and weight. Errors of a few grams are inevitable for manually sand-casted items. Craftsmen pay utmost attention to minimise such errors. 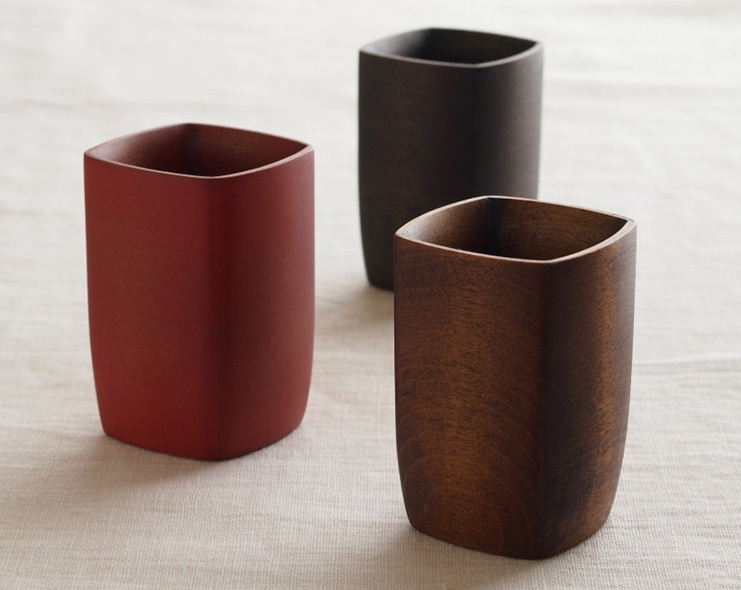 Oji Masanori has designed several products for lacquer company Wajima Kirimoto, these are sake cups produced by the craftsmen in three different colours. 9. 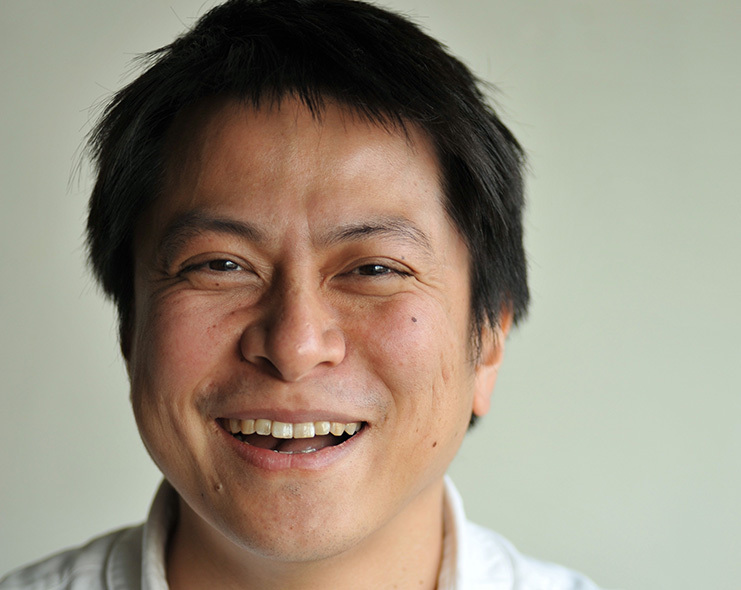 You recently designed some lacquerware for Wajima Kirimoto. What did this involve? How did you approach this particular project? Mr Kirimoto, the owner of Wajima Kirimoto, published a book called “Itsumo no urushi (Our usual lacquerware” eight years ago. The director of the book asked me if my infant son could be a model for the book. That’s how I met Mr Kirimoto. I designed several products for one-off production after that. About a year ago, Mr Kirimoto offered me to work with the management and sales teams of Wajima Kirimoto. I have since been in charge of the branding and product design to maximise the unique features of Wajima Kirimoto’s resources. 10. Your works have a timeless quality. What are the key things you look for in any object? When I design, I give my full attention to the material and technology involved. I constantly ask myself, “Is this the right material?” and “Is this the right technology?” I never use certain material or technology just so that I can achieve a certain form. It is often mistakenly assumed that there is a “perfect form” in the world of traditional arts and crafts. This isn’t true. It is quite important to search out the beautiful appearance buried in the gradation between the raw material and the finished product. 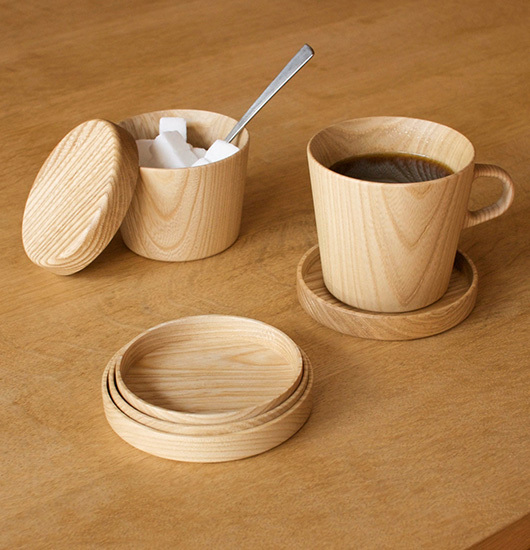 KAMI series designed by Oji Masanori, produced by Takahashi Kougei and his team of skilled woodworkers. 11. What inspires you at this moment in time? My own everyday life. Catching a glimpse of my friends’ lives in Japan and abroad. Talking to the company presidents and craftsmen in the factories. Chatting with the shop staff. Museums in various cities storing excavations. By seeing and hearing these things, I wish to make products that help the maker and the user to connect with one another and live together in continuity and harmony. 12. Is there anything you would like to explore in the next 5 to 10 years? I am currently working on setting up a shop called “Kumu (To link, partner up or unite)” together with my friends in Japan. I have close relationships with shops and groups in Japan and abroad that sell my products. Many of them serve as communities in their regions, and I admire the way they communicate with people. So we are trying to do the same in Tokyo. We want to create a place where people can gather together and become friends. We also want to have all my products in one shop. We started to work on this project last year, and hopefully the shop will open next spring. The world is a collage of people and things from all over the place. They may appear unrelated, but they fill the space with positive energy when they meet one another in appropriate settings. We aim at creating a place for those pieces of the world to get together. This is going to be the most exciting project in the next few years. Jicon is a new line of porcelain that uses local clay and centuries-old techniques on modern designs. 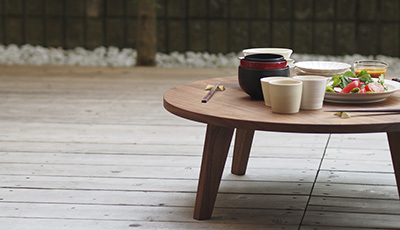 A collaboration between Oji Masanori and the Touetsugama kiln in Arita. 13. What influence do you want your objects to have on design as an industry, also on a room or interior space? I don’t want designs for high-volume production and heavy consumption to grow popular. What I would like to promote are the designs that enable human culture and our respect for it to continue. I would like to focus my energy on designing something that will get everybody to become closer. As for interior space, I would like to create more items to which the users can connect personally. I am not so keen to increase the number of “good things”. 14. Finally, what would you say to other young designers out there who want to follow a similar path? There are people and places out there that yearn for you. Until you encounter them, please keep challenging different things seriously. There will surely be a day when you are thanked. So stay open to all possibilities for now. Oji talking and meeting up with Japanese glassmakers Studio Prepa, working on their glass collaboration titled Hand Some.